I came across this image of a calloused hand holding a small metal cross about eight years ago on the cover of the X-Fest official programme in Kerrang! magazine. 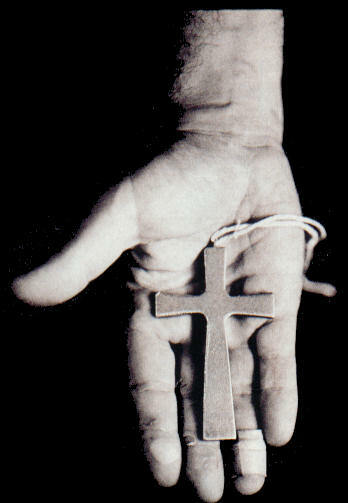 It’s from a photograph of Bill Ward — the drummer from Black Sabbath — hand holding his Black Sabbath cross. But there is something about this image that speaks to me of God the Father’s relationship with Jesus, God the Son. The photograph speaks to me of God the Father holding Jesus, the crucified, resurrected Christ. And the calloused hands of God the Father demonstrating that Jesus’s experience of death and resurrection have had a profound and lasting effect on God the Father. God the Father does not sit in heaven, stoically unaffected by the death and resurrection of Jesus. Paradoxically God the Father is right there in the middle of the experience of the death and separation of God the Father from God the Son. “My God, my God why have you forsaken me? !” The reciprocal call of Son to Father, of Father to Son. God the Father is right there in the middle of the resurrection, the restoration of life, of hope, of healing. When the crucified Jesus is called the ‘image of the invisible God’, the meaning is that this is God, and God is like this. God is not greater than he is in this humiliation. God is not more powerful than he is in this helplessness. God is not more glorious than he is in this self-surrender. God is not more powerful than he is in this humanity. are brought together in a wonderful exchange. that we might forever dwell in you. A further demonstration of how much God loves us: God became human, that we might become divine.